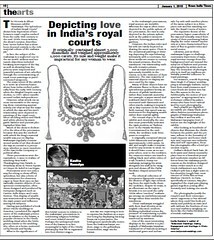 Click here to read Kavita Ramdya’s “Depicting Love in India’s Royal Courts” in “News India Times” (1 January 2010). The V&A exhibit “Maharaja: The Splendour of India’s Royal Courts” shows how depictions of love between royal couples evolved from the early 18th century to the mid-1930s. Anna Jackson, the show’s curator, describes how “never before has a show been devoted entirely to the rich material culture of the maharajas”. In fact, the subject of the maharaja is a neglected one in the art world. 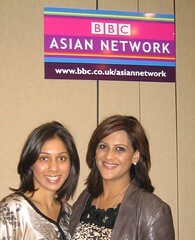 Anna and her team’s objectives in organising the show included breaking stereotypes of the raj as well as showing how the princes were respected and powerful patrons of art whether through the commissioning of royal-court paintings, Rolex watches for playing cricket, or jewel-encrusted weaponry. The main intent of the exhibit is to serve as a history lesson for how India evolved politically from the early 18th century when the Mughal Empire was in decline to 1947 when Gandhi secured India’s independence. However, what struck me as most memorable in the sweeping show containing approximately 250 objects was the ways in which the raja and his rani’s relationship were depicted in paintings of the royal court, silent wedding videos, and black-and-white photos by avante-garde fashion and portrait photographer Man Ray. Much of the show is dedicated to the idea of the procession because this was the method with which the king’s material wealth was put on display. Maharajas regularly commissioned works of art that showed the raja as central in a procession, whether to meet members of the East India Company or political allies. These processions were the equivalent, I came to realize, of watching New York’s Thanksgiving Day Parade, a Broadway show in Times Square or Cirque de Soleil in Las Vegas. Processions were not only a way for a king to show off his splendour but also a form of entertainment for observers eager to feast their eyes on fantastically creative objects of conspicuous consumption, often times designed and produced by European designers such as Cartier, Rolls Royce, and Luis Vuitton. This display of wealth was instrumental in reinforcing the raja’s power and influence among his subjects. Having just published a book about Hindu weddings in America, I pondered the significance of the maharaja’s procession in relation to the baarat, a popular element in the Hindu wedding ritual where the bridegroom travels to the wedding site, often on a horse, surrounded by friends and family. What is the significance of this bridal custom in relation to the maharajas’ processions in celebrating religious holidays and court-related events? Perhaps the widespread tradition of the baarat, an element of the Hindu wedding ritual which until recently I didn’t consider having any religious significance, is in fact meaningful in light of the Hindu philosophy that life is organised into four distinct stages. Just like the royal king is seen to express his darshan as a superior being by displaying his kingliness via a procession, the bridegroom symbolically moves from the brahmacharya, student, stage to the Grihasthya, householder, stage via the baraat. In these processions, royal women are invisible. Whereas the raja is often times depicted in the public sphere of the procession, the rani is only depicted in the private sphere such as the palace’s women’s quarters, hunting grounds and gardens. However, the Indian ruler and his wife are rarely depicted as sharing the same space. There is the occasional painting or drawing depicting the raja behaving intimately with a courtesan, but these works are meant to convey his sexual prowess, thus his manliness. His relationship with his wife remains private. Just as royal women are conspicuously invisible in the courts, so is the evidence of their existence. The vast majority of material objects on display are ones used by the rajas. Many of these objects have an effeminate flavour to them; their splendorous qualities betray an element of girlish lavishness rather than mannish austerity. For example, a Jaipur sword and scabbard dated from 1902 is encrusted with diamonds and other jewels, making it impractical to slay enemies on the battlefield; instead, this sword was an instrument for displaying wealth rather than martial agility. The central object in the vast exhibit and, ironically, the one which most powerfully indicates the raja’s position as, to appropriate a much-abused phrase in the contemporary fashion world, “fashion icon” is the Patiala Necklace. Commissioned in the mid 1920s, the necklace took three years to complete. It originally contained almost 3,000 diamonds and weighed approximately a thousand carats. Its size and weight make it impractical for any woman to wear. So it should have come as no surprise when, next to the necklace, the museum visitor can watch a rolling black-and-white video of a tall, bearded, heavy-set maharaja swinging his arms alongside his staff as he swaggers and shows off the Patlia Necklace draped around his neck. The ethereal collection of interwoven diamonds conjures the illusion of light rays emanating from the raja’s burly chest; the necklace, despite its mass, is as effeminate as the raja is brutish. It is not until the early 1920s when “modern” maharajas emerge as multi-dimensional beings rather than models for manliness. These maharajas struggled with their dual identity as an English-educated, modern-thinking individual versus the pressure of maintaining a public image as Indian maharaja restricted by tradition. One of the most interesting displays in the exhibit is a photograph of Maharaja Sayajirao Gaekwad III of Baroda wearing a traditional gown and turban side-by-side with another photo of the same subject in a three-piece suit and hat standing outside the Royal Courts of Justice. The repetitive theme of the procession, hyper-masculinity of the raja and sexually-vexed femininity of their purchasing habits display the move towards Modernity as a time characterized by a state of flux in gender roles and social mores. Likewise, just as these maharajas began to challenge customary depictions of rajas, royal women emerge from the background and are instead the subjects of fashion and portrait photography by re-known artists such as Man Ray. The invention of photography is in itself an insidious yet visually-powerful influence in royal paintings. For instance, a work depicting Ram Sing II of Jaipur worshipping is amazingly realistic; worry lines from royal pressures and court feuds are woven into his face like waves in the sea. Additionally, the notion of “perspective” is appropriated as a technique utilized by palace artists who have been radicalized by court photography. Man Ray’s playful yet dignified, accessible yet classy black-and-white fashion/portraiture photographs of Maharaja Yeshwant Rao Holkar II and his wife Maharani Sanyogita Devi of Indore are the highlight of the exhibit. After looking at hundreds of objects which illustrate the divide between the public and the private, adhere to the formality of royal etiquette, and honor tradition and customs over individuality and self-expression, these few photographs offer a brief yet oceanic respite. Holkar’s slicked-back hair, 30-inch waist and dainty mustache place him in a historical period and Modernist mindset as different from his maharaja predecessors as the Krishna-designed Rolex cricket watch is to the Greek civilization’s Sun Dial. Holkar’s wife, Devi, has a slight wave in her shoulder-length hair reminiscent of 1930s film actress Marlene Dietrich. In Paris, specifically at Cannes, Man Ray photographed the royal pair playing games together, posing affectionately, and teasing one another. The photographs justify the couple’s and their contemporaries’ eagerness to live abroad where they can live both privately and publicly as man and wife without the burdens of custom and tradition weighing on them like the Patlia Necklace on a brutish maharaja. 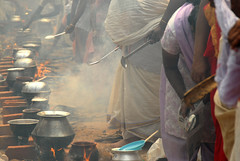 I enjoyed talking to Jules Lily about her journey to Kerala where she discovered the Pongala Festival. 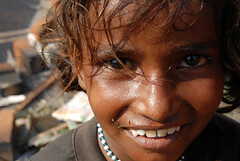 Please visit http://www.photoeast.info to view Jules Lily’s beautiful series of Pongala images. Listening to Jules Lily’s story of what brought her to India where she photographed Kerala’s Pongola Festival is as fantastic and magical as the country itself. Her history, in addition to serving as a testimony to the power embracing India and its traditions has, has also won her artistic recognition including an invitation to display her photographs as part of London’s Photomonth, the UK’s largest photography festival featuring the works of more than 150 artists, where more than one thousand viewers have visited her show entitled “Photoeast” (www.photoeast.info). Born in Slough, an ethnically-diverse community, Jules’s interest in India was piqued by both her Tamil step-father and surrounding Indian and Pakistani communities. Jules, dressed in clothes typical of an over-worked yoga teacher who spends too much time on buses and Tube subways always just making it in time for her next yoga appointment, is carrying an overly-stuffed backpack which contains a laptop containing her photos, enough scrunched-up yoga clothes to serve a month in India without washing, and marketing postcards she distributes to book stories, retail outlets, temples, and yoga studios to promote her exhibitions. Full disclosure: Jules is a member of the yoga community and close friend of my Acroyoga teacher; Kerala is the region from which my bestfriend and maid of honor’s family originates, so when I heard of Jules’s work I was eager to talk to an artist who works in the yoga community and documented a women’s festival in South India, particularly since much of the art from the subcontinent featured in London is usually from Rajasthan. Jules tells me how growing up in Slough with her Tamil step father and Indian and Pakistani friends served as “loads of influence”: “they talked about home and I always wanted to go”, she tells me. Her first trip to India took her to the north where she fell in love with the countryside but was turned off by the “crazy” cities. However, it was in Varanyasi that she discovered the spirituality of the country. In Varanyasi, she tells me, Jules realised she witnessed spirituality and “wanted to take it back with me to England”. “After visiting India for the first time, I wanted to photograph the colors and the joy of the Hindu religion and show how it is different from religion in England” she tells me. We talk about the joy that permeates in all the Hindu weddings and religious festivities we’ve been a part of and how this joy differentiates the faith from many of the western belief systems which are far more sober even in times of celebration. Jules fantasized of returning to India. Avoiding North India for its crowds, pollution and hectic pace, she instead made her way to Kerala which she describes to me as a “soft and gentle healing place” with clean air and good food. In Kerala she found a yoga instructor and reiki healer, embarking on what she describes as a “magical” time in her life which included riding the local railway so she could photograph and explore South India. For Jules, living in India is a series of spontaneous and fateful experiences meant to unfold. When her train stopped in Pongola, she saw masses of women carrying cooking pots and firewood with no men to be seen. Moved by the image of so many multi-generational women destined for the same place, she jumped off the train and followed them to Trivadrium where she realised the whole city was swarming with women celebrating Pongola, an annual women’s holiday. When asked what Pongola is, Jules tells me it is an offering of porridge made with cinnamon and spices and wrapped in banana leaves which the women eat as patty wraps. Jules describes how despite she was one of the few non-western women, she was welcomed at the festival where she stayed for three days. In Pongola she witnessed what she and much of the western media did not think was possible: a women’s holiday where 2.5 million women travel from afar without the company of their husband, father or brother, and celebrated the opportunity to see friends from other villages they hadn’t seen in a year since the last Pongola. Listening to her describe what it was like living among these women during the festival, I thought of Charlotte Perkins Gilman’s novel “Herland” (1915) where the author describes a fictional world where women reproduce asexually and live in Herland, a clean, well-structured, safe and efficient society unmarred by war, starvation, or poverty. In some ways, Jules’s description of the Pongola Festival is the realisation of Gilman’s utopia dream if only on an annual basis in India versus America which Gilman felt was in deep need of social reform. Despite sleeping and cooking on the streets and relying on the indoor plumbing of strangers who would make their homes available to these out-of-town visitors and care for the sickly, Jules describes how safe she felt: “there was no street traffic and stores were closed” she describes. In place of a police force, there were a few police men and temple guards but many police women at hand. “I felt safer sleeping in the streets in Pongola than I do in London”, Jules tells me. Researching the Pongola Festival is a challenge because the communities who participate have not made the initiative to promote the women’s holiday globally. Jules theorizes the general lack of promotion as characteristic of the Malayum who, she says, are “very confident; they don’t need outside approval”, meaning the recognition of western media. Earlier this year, Jules returned to the Pongola Festival, this time for five days and with yoga friends, most of whom “ran back” to their quiet, organised yoga retreat. Jules explains, “They were turned off by lack of organisation and the cooking smoke and the chaos of the festival”. When I ask her how the large crowds she’s drawn to her London exhibit has reacted to her work, she shares curious anecdotes which are, again, a testament to the power of her photographs. At “The Foundry”, an art bar in East London, Jules plays a CD containing mantras despite the fact that her audience are often times drunken party goers. However, she describes how they enter the show rowdy and rambunctious but settle and calm down as they tour the images. She describes how one Thursday night, “a group of anarchists looked at my photos and they got it! At the end of the show, a few of them sat and meditated.” One, she tells me, “had tears in his eyes and said how he had lived in Varanyasi once and hadn’t felt this way since then”. Jules’s honest and vivid prints, no doubt, have a calming effect on the viewer. Like a true yogi, Jules speaks with the language of healing and yoga when she describes how the funds she raised teaching yoga paid for the production of prints, “like prana flowed right through to pay for the prints”. She describes her photographs as “sweeties, dipped in ghee”. Apart from their vivid colors and honest-faced subjects, the photos convey a communitarianism that is virtually nonexistent in the west. 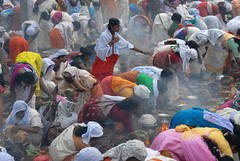 The photographs depict infants and children, mothers, sisters, cousins, aunts, and elderly women cooking, talking, coughing and praying practically shoulder-to-shoulder. Looking at the photographs, I could feel the intimacy between the women as they celebrated their holiday and took advantage of the opportunity to live and express themselves safely and among friends. Jules describes an “atmosphere of complicity and trust… there was a warmth between the women because they believe that G-d will provide.” It is an awesome experience to look at Jules’s photographs, particularly in the context of understanding the significance of Indian women travelling and living independently of men where they continued with their householder duties while indulging in and enjoying their relationships with other women. At Pongola, there are virtually no men present, no way of feeling guilty or distracted from spending so much time with women rather than caring for the men. And, symbolically, the women dress their daughters as little goddesses: Kerala is almost 100% literate, the state in India with the highest standard of living. It is also a matriarchal society, and the playful making up of their daughters is an overt display of these women’s power and influence in their communities. We talk about the women at Pongola, and I vow to Jules and myself that I won’t share with anyone when during the year the festival takes place in order to preserve the sanctity and sacredness of the Keralite women’s holiday. We talk about the images of Indian women Jules shares with the world in her photographs and how they contradict mainstream images depicting women of the subcontinent. Jules agrees, saying, “These women aren’t rich, but they certainly don’t feel like victims to me!” (Please visit http://www.photoeast.info to view the whole series of Pongala images). 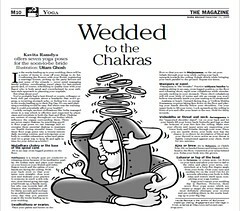 Click here to read Kavita Ramdya’s “Wedded to the Chakras” in “India Abroad”. In the weeks leading up to your wedding, there will be a litany of items to cross off your “Things to Do” list. Confirming the flowers with your florist, registering a marriage license, picking up the bespoke party favours are just some of the errands—never mind managing family politics, coordinating travel plans for last-minute guests and, of course, scheduling in quality time with your fiancé who is both awed and overwhelmed by your military-style oversight of planning your nuptials. But what about you? You’ve probably had a best friend or cousin, colleague or book club pal complain about a headache that won’t go away, a recurring stomach ache, or feeling low on energy in the weeks leading up to their Big Day. No one said planning a wedding would be easy, but where was the warning that it could potentially effect your health?! Luckily enough, ancient civilizations like India managed stress in a way which is effective and respected by physicians and scientists in both the East and West. Chakras are centers of energy throughout our bodies which influence the organs surrounding them. There are seven major chakras; by practicing specific floor yoga poses we can massage and re-energize these essential chakras to maintain our health during stressful times. Combine these floor yoga poses into a twenty-minute daily morning routine, and reinvigorate your body to combat exhaustion, aches and pains. And it’s a great way to keep fit and agile in time for your debut as a bride!! Muladhara chakra or the base of the spinal cord: sit in an easy cross-legged position on the floor. Siddhasana is a simple pose yet conducive to releasing stress because of its meditative quality. Sit Indian style and place your hands on your knees so your thumb and index fingers touch and the palms of your hands are facing the ceiling. Hold your back erect so that your spine runs straight: close your eyes and dedicate your practice to someone in need- a sick relative, close friend going through a bad break-up, a family member who was recently laid off. Practice this meditative pose for thirty seconds and increase by an additional thirty seconds every day that you practice yoga in the weeks leading up to your wedding. Swadhisthana or ovaries: Place your palms and knees on the floor so that you are in Marjaryasana, or Cat Pose. Inhale through your nose while curling your back upwards towards the ceiling. Exhale slowly while bringing your back parallel to the ground. Repeat ten times. Manipura or navel: Pranayama is “the breathe.” Practice uddiyana bandha by making sitting in an easy, cross-legged position on the floor and releasing short, rapid nose exhalations while simultaneously sucking in your stomach. These short exhalations will rid your body of toxins and stir an energy you won’t believe was already inside you just waiting to be awakened! Anahata or heart: Upward-facing dog, or Urdhva Mukha Svanasana, requires laying face down on the floor and placing your hands directly below your shoulders. Use your upper body to lift your torso. Look upwards at the ceiling in front of you and offer your heart to the sun. Hold for thirty seconds. Vishuddha or throat and neck: Sarvangasana is the “supported shoulderstand”: Lie on your back and let your hands lift your lower back, buttocks and legs so that the bottoms of your feet face the ceiling. Make sure your elbows and upper arms are supporting your lower body and breathe through your nose. Since you are upside down, your body now has the chance to re-direct its circulation of blood and your thyroid is more active as your throat is lightly compressed against your chest. Hold for two minutes. Ajna or brow: Sit in Balasana, or Child’s Pose. Sit on bended knees and bring your forehead to the floor. Outstretch your arms behind you. Relax your body into the grown. Sahasrar or top of the head: Lie in Savasana, or corpse pose. Lie down on your back and allow your feet to fall to the sides and place your arms, outstretched, at a forty-five degree angle from your body. Close your eyes and mediate for on the word “Om” for thirty seconds, allowing your body to fully relax and restore itself upon completing your yoga routine. Yoga won’t ensure your wedding day is flawless. However, these seven floor yoga poses which are meant to target the seven chakras will most definitely eliminate your worries and pre-wedding jitters in the weeks leading up to your Big Day. 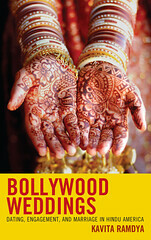 Click here to read an excerpt from Kavita Ramdya’s “Bollywood Weddings” in “The New Global Indian”, “The Wall Street Journal” India edition. 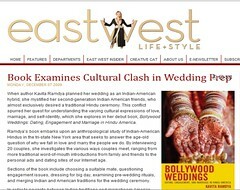 Click here to read coverage of Kavita Ramdya’s book “Bollywood Weddings”, “Book Examines Cultural Clash in Wedding Prep“, in “East West” magazine.